Photo of the Week. 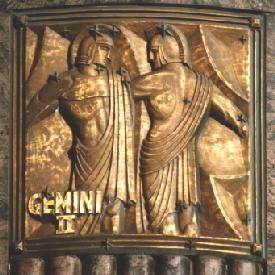 Gemini in bronze decorates the outside of the original Adler Planetarium. Astronomy news for the week starting Friday, November 16, 2001. The Moon first becomes visible tonight, Friday the 16th, as it clears its new phase and climbs the western evening sky as a waxing crescent, Earthlight on the lunar nighttime side seen in all its glory. The crescent phase ends with the first quarter the night of Thursday, November 22, to help those in the US celebrate Thanksgiving. The night before, Wednesday November 21, the near-quarter will pass three degrees south of still-bright Mars, which continues to hang low in the evening southwest within the confines of Capricornus between much dimmer Uranus and Neptune. The giant planets creep ever more into the evening sky. Saturn, making a fine configuration with Aldebaran and the Hyades in Taurus, now rises in twilight shortly after sundown. Jupiter, beautiful in eastern Gemini, unmistakable comes up about two hours later (about the same time as Betelgeuse in Orion), after which it dominates the heavens as befits the king of the planets. However, Venus, because of its proximity and reflective cloud cover the brightest of all the planets, is becoming increasingly difficult to see, as it is now rising rather well after morning twilight begins. Look for it low on the eastern horizon before sunrise. But planets take second rank this week beneath the banner of the Leonids, one of the great meteor showers of all time. Because of its reliable annual nature, the Perseids of August are better known. Usually the Leonids, produced by dusty debris flaked off Comet Temple-Tuttle, are not very impressive. However, following along behind the 33-year-period comet are concentrated chunks of the stuff. If the Earth passes through one of them, we get not just a meteor shower but a meteor STORM. In 1833 the count was tens of thousands of meteors per hour. The 1967 storm was spectacular. Over the past two years we have witnessed fine showers with many big fireball meteors, but no storm. Perhaps this will be the year. Whether so or not, it surely is worth the look. The best time is predicted to be on the morning of Sunday, November 18 shortly before dawn, around 4 AM Central Time. Meteor showers seem to emanate from their own particular "radiants" in the sky, a perspective effect, as the paths of the particles that make them are really on parallel tracks. The position of any radiant depends on the motion of the Earth and of the particles at the time we pass through the swarm. The Perseids seem to come out of Perseus, the Leonids from the Sickle of Leo, which will be well- up in the eastern sky. Even if the big event does not occur, you can at least admire the winter stars hurrying off to the west, Orion prominent, brilliant Sirius lighting the southern sky.